Video of the two Palestinians killed last Thursday at an annual Nakba Day protest outside of Ofer prison show the youths did not pose a threat to life to Israeli soldiers. And a photo set reveals one medic was shot in the head while aiding a wounded youth. The CCTV footage released by Defense of Children International-Palestine captures Nadim Siam Abu Nuwara, 17, standing with a group of youth before he collapsed to the ground. Mohammed Mahmoud Odeh Salameh, 16, was also killed in the demonstration, along with one other protester critically wounded from live-fire. Abu Nuwara is hit at 48 seconds into the video. On Friday after a funeral procession in Ramallah, I rode to an outdoor prayer ceremony with a Palestinian journalist who photographed Abu Nuwara’s final moments, the youth in the video footage. Sitting in the car with Samer Nazzal, 28, from Raya FM, I was shown a series of images where a medic lifting Abu Nuwara is being struck in the head with a rubber bullet. Nazzal circled the rubber bullet to outline it before the moment of impact. In the following picture, the medic is seen cradling his head. “Yesterday it was really difficult—they [the Israeli Defense Forces] used real bullets from the start. They were aiming to push protesters back they were aiming to kill,” said Nazzal. “It was bizarre because the clashes were normal,” continuing, “I want you to write they weren’t holding Kalashnikov’s or M16s or RPJs, they were just throwing stones from far, far away and never did the stones strike a soldier,” he said. 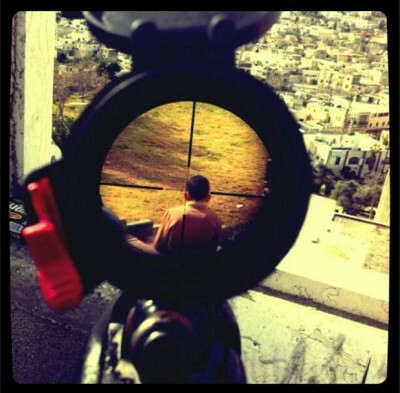 Nazzal took the pictures while taking cover with other photographers from live-rounds fired by the Israeli army. Nazzal careened from behind a building and saw Abu Nuwara throwing stones, but by the time live-fire struck him, the youths had stopped. “He was so alive and the next minute he was lying on the street and put his hand on his chest.” Nazzal then snapped probably the most circulated photo of Abu Nuwara just before death. He kept photographing as a group of youth and one medic moved to lift Abu Nuwara and carry him to an ambulance. Then Nazzal noticed the medic. “I saw him holding his head like he had been shot. But after I went back to my office and I saw a rubber bullet in the frame,” said Nazzal. Indeed Nazzal images confirm the Israeli army did fire at the first responder and others who were attempting to transport the lethally injured youth. The live-rounds used against the Palestinian protesters at the Nakba Day demonstration and the rubber bullet fired at the first responder comes two months after Amnesty International’s report “Trigger Happy: Israel’s use of excessive force in the West Bank” outlined how “reckless force” from the Israeli army and police since 2011. “In all cases examined by Amnesty International, Palestinians killed by Israeli soldiers did not appear to be posing a direct and immediate threat to life,”said the organization. Since the beginning of 2014, ten Palestinian civilians have been killed by Israeli fire. Last year Israeli forces killed 22 Palestinian civilians in the West Bank, 14 during demonstrations.